These truffles are astoundingly good. Set aside their lofty-ish price ($4.49 for about 15 pieces), their pink, floofy, girly packaging, and the fact that white chocolate just isn't as trendy or as "good-for-you" as antioxidant-rich dark chocolate—and you might be able to appreciate them for what they truly are: a festive, top-shelf candy product with a sweet, balanced flavor infused with strawberry, and an amazingly-inviting texture that will have you straining not to eat the whole box in a matter of minutes. They're perfect for any special occasion, be it Christmas, New Year's, Hanukkah, Kwanzaa, Boxing Day, Festivus, your birthday, or next Friday night. Even Sonia—not a white chocolate person at all—was so enthralled by the flavor of this product that she was inspired to make another short video review. She gives the product an enthusiastic four and a half stars. Same here. Interested in the nutrition facts? Jump to about 0:40 in the video. Are these found in the frozen section or the candy section? Thanks! They were on those candy shelves above the frozen section, near the holiday candies. Probably seasonal, but who knows? I bought a box tonight. I am certainly not a lover of white chocolate which is not true chocolate. 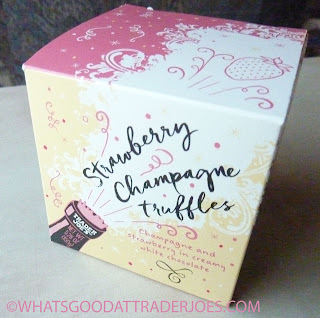 But I was impressed with the champagne concentrate in these and the creamy strawberry flavor.